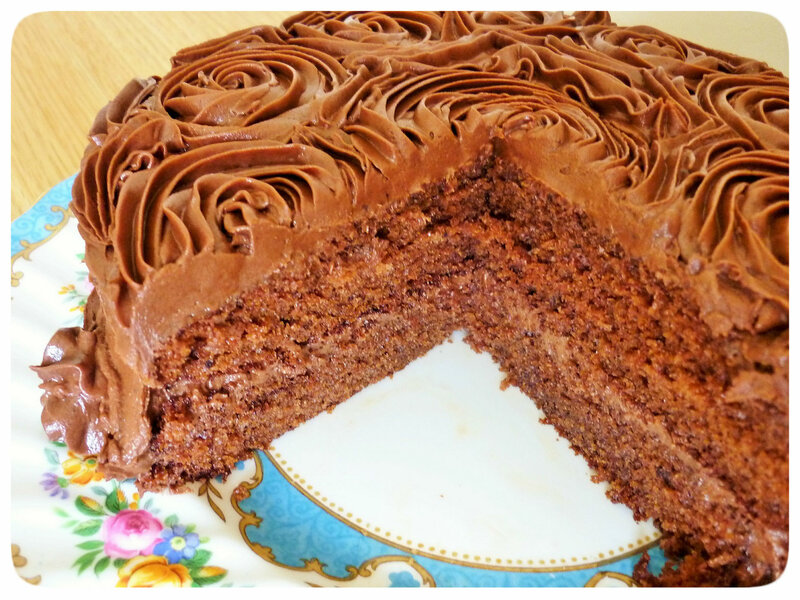 I searched around for a while, looking for a chocolate cake recipe I believed would produce the texture I wanted. I finally went with one from BBC Good Food and it’s delicious! So easy. Sieve all the dry ingredients into a bowl and then put them in a food processor. Add the eggs, golden syrup, milk and oil. Blend everything until smooth. The mixture is quite liquid – that’s ok! 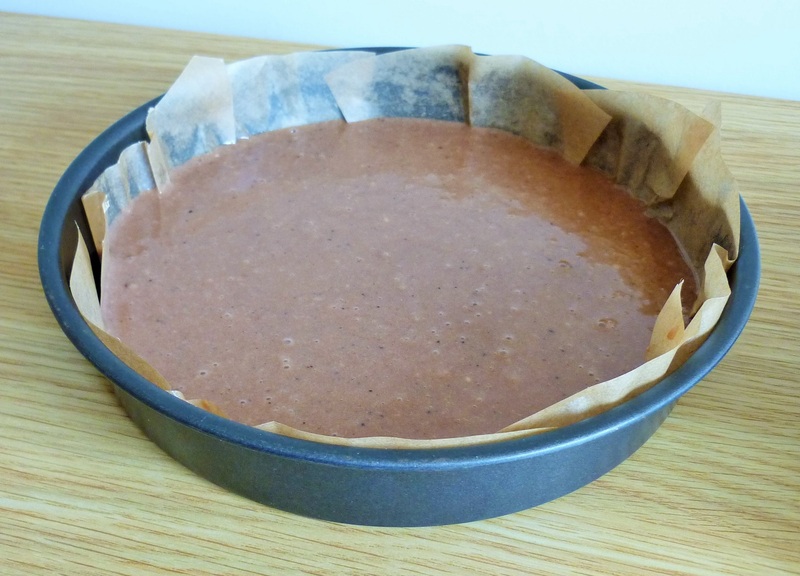 Pour it into two, lined 7-inch round tins and then bake in an oven pre-heated to 180 degrees C for 25-30 minutes. 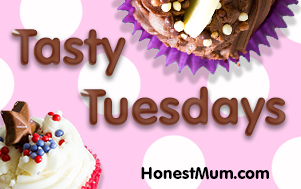 The mixture pre-bake is very runny – don’t be alarmed! 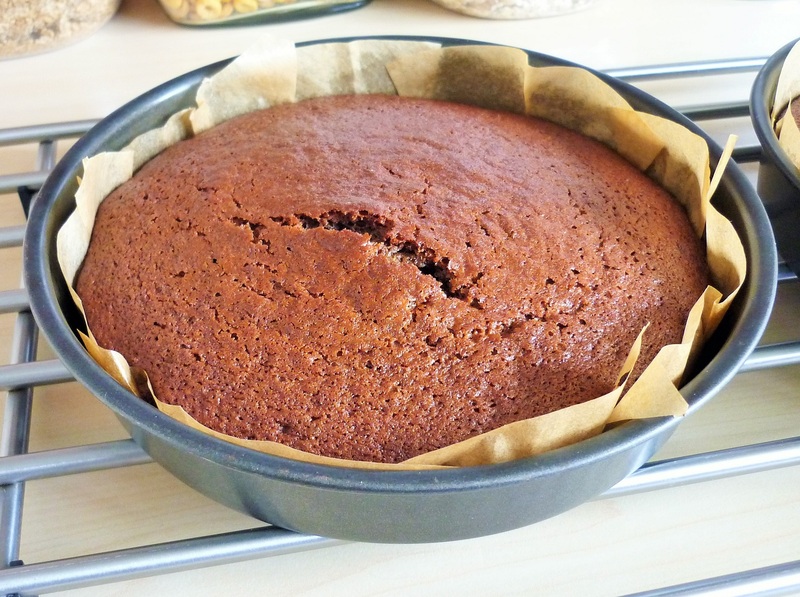 The cake after baking – rises nicely! 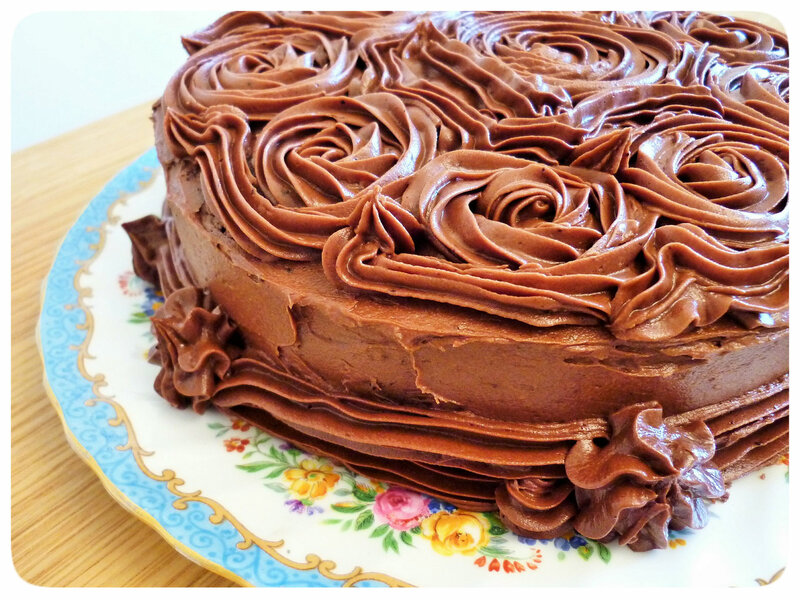 You don’t have to pipe the buttercream between the two cakes or on top, but I felt like giving rosettes a try. 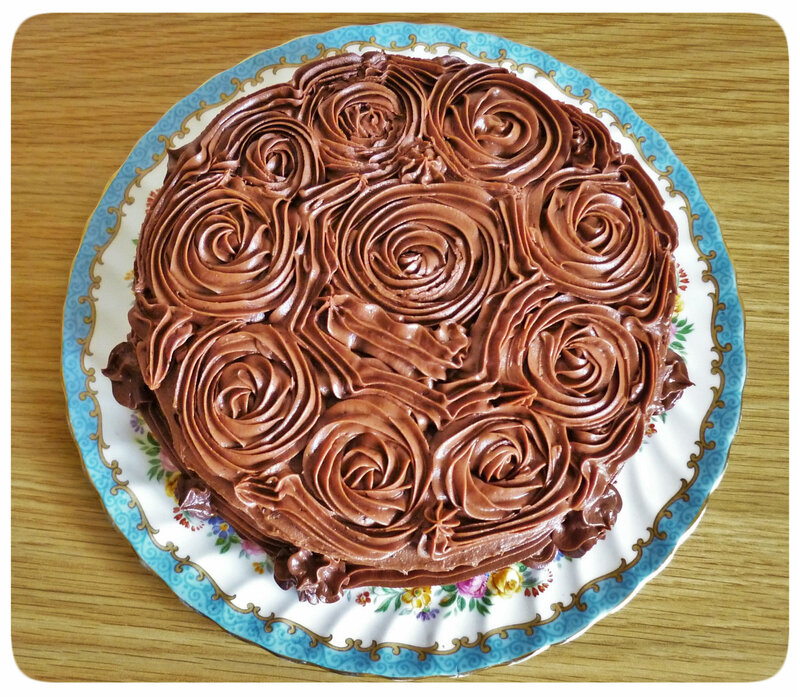 I covered the cake in a smooth-ish layer first, applying the buttercream with a knife, then used a piping bag fitted with a star tip to make the rosettes. 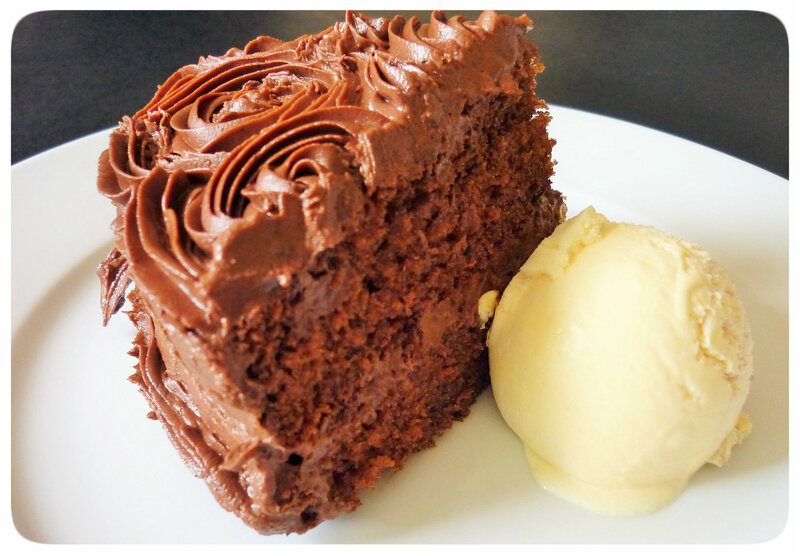 This cake is a great dessert when served warm with some ice cream! I love Chocolate amd anything woth chocolate in it, on it or with it. 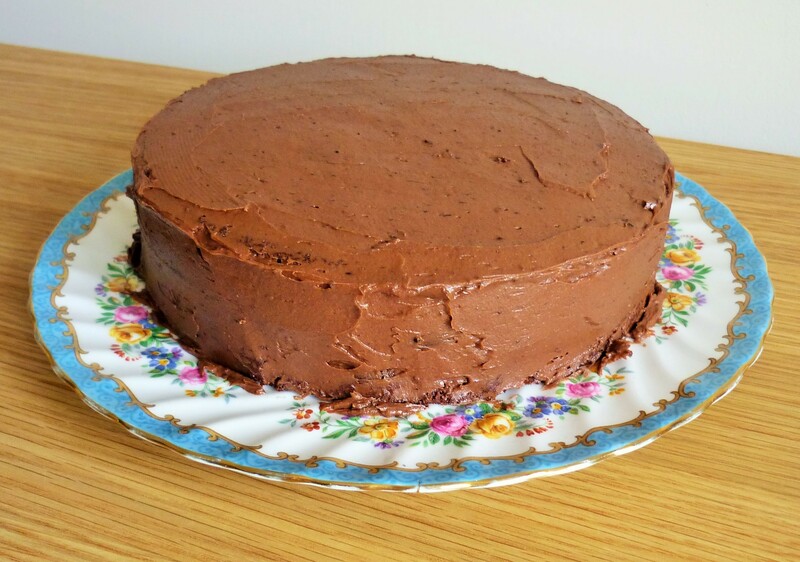 And I especially love Chocolate fudge cake. And this post makes me crave it. We do have that in common then! I will let you know how it goes I will try and make it look as fab as yours too! Your rosettes are gorgeous. I love the aerial view! The cake itself looks very tasty too. Thanks for visiting – I’m off to have a proper look at your blog now. Love the sound of Blueberry Lemon Danishes! I think I gained half a pound reading the recipe. It sounds good! This was my hands down favourite treat as a child!! Looks so yummy my mouth is watering slightly….ok I’m drooling!! 😀 I love the idea of making all the foods associated with a book but it must feel so special when it’s your own. Your blog is going to make me fat, Claire. When I worked in an office, I baked A LOT because I could always take the cakes/brownies etc. to work and they would disappear and it cheered people up too. Then when it was just my husband and I, I quit baking for a while, because I was accused (unfairly, I might add) of making him fat. But now I have a toddler who burns everything he eats in about 5 seconds, I’m back to baking 🙂 I would add at this point that he does mostly eat healthy things… the odd bit of cake never did anyone any hard. This one is really easy to make and so delicious too 🙂 Particularly with some ice cream… one of my favourites! We’re fine here, thanks. The usual toddler colds and snuffles, but otherwise fine. We’re making biscuits this afternoon 🙂 I hope you’re well! I’m well thanks. Too busy these days and I’m not getting what I want done really. Sweet geney mac, that icing is done amazingly! 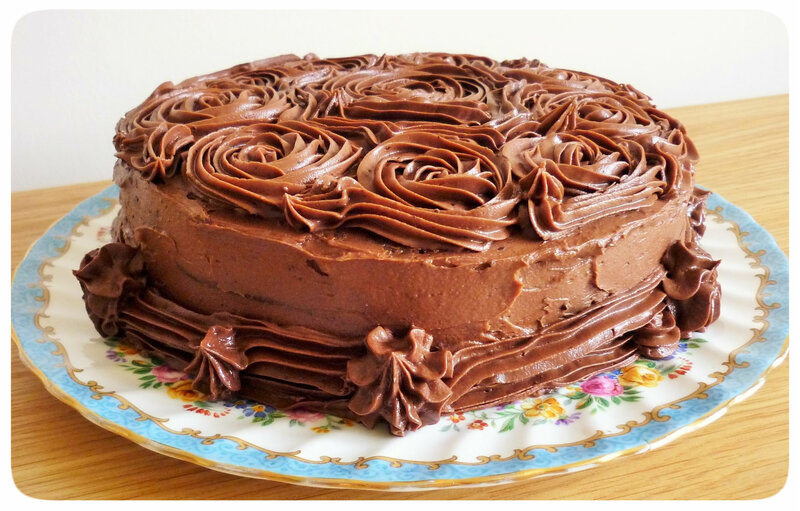 How great that you must be able to write so easily on baking, the book I’m writing at the moment is actually me living out my desires of really, really wanting to be able to bake and actually (in real life) the ability to produce something like this is way beyond a dream. Baby steps though, am still trying to master the icing on fairy cakes! Wow and well done x ps I adore the BBC Good Food website!